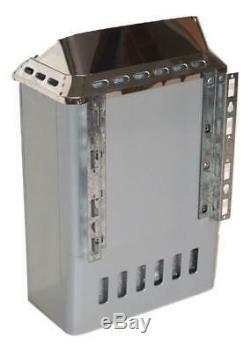 Standard control for any sauna heater models - Many sauna buyers prefer the built-in controls for its ease of wiring. Built-in Controller located at the bottom of the heater - Included Built-in time knob controller - Included Built-in temperature knob controller HIGH-TEMPERATURE CUT-OFF PROTECTION - OVERHEATING PROTECTION The temperature is controlled by the build-in thermostat sensor. 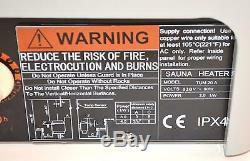 However, if for any reason, the air temperature inside the heater rises to an abnormally high level, the overheating protection automatically cuts off the power supply. When the heater has cooled down the power can be on again by pressing the reset button. Before pressing the reset button, the possible cause of overheating should be investigated. 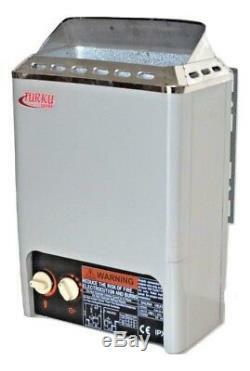 TURKU SAUNA HEATER SPECIFICATIONS MODEL - TUM20A RECOMMEND SAUNA ROOM VOLUME - 45-90 Cu. SAUNA TYPE - WET or DRY SAUNA HEATER TYPE -MINI CONTROLLER - BUILT-IN, KNOB OPERATING TIME - 60 MIN POWER - 2KW VOLTAGE - 120V CURRENT (Amp) - 18Amp PHASE (N) - SINGLE WIRE - 10AWG CIRCUIT BREAKER (Amp) - 25Amp SAUNA HEATER DIMENSIONS - 19-13½-7 inch. MUST FOR ANY SAUNA ENTHUSIAST. 1 GALLON SAUNA SINGLE HANDLE BUCKET with LINER and 16 LADLE - Beautiful Wooden Sauna Bucket with single handle design is comfortable to carry. An essential sauna accessory, this bucket holds up to one gallon of water to splash over hot stones to create vapor. It is made of natural pine wood. This version of the classic sauna bucket is bottomless. A form-fitting plastic insert holds the water but is nearly invisible when placed inside the bucket. This updated version gives you all the beauty of the wood original but with more durability and a much longer life. Hand carved from a solid section of wood this 16 long ladle is designed for use with the standard 1 gallon bucket. It has a generous spoon cup to easily facilitate pouring water over your sauna rocks to create that instant burst of steam that intensifies the sauna experience. It can also be used to pour water over your head and body to cool down the intense effect of the dry heat. There is also a leather thong attached to the ladle so that it can be hung up to dry when it is not in use. Please Note, because these buckets and ladle are made from natural cuts of wood, the tone and grain may differ from piece to piece, making each product one-of-a-kind. 17 LONG HANDLE BATH & SAUNA BRUSH. Try our Bath & Sauna Brush. Soft bristles cleanse and perk up the skin. 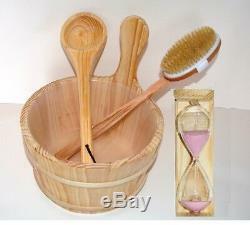 Sauna brush is a good tool for helping to cleanse and massage a sauna bather's skin. The soft bristles of most sauna brushes aid skin exfoliation and can contribute greatly to a sauna session that is refreshing and invigorating for the bather. Using a sauna brush properly can also improve blood circulation, So there's really no good reason to not have a sauna brush among your sauna accessories. The long handle allows you to deliver foaming action to the most far-off regions of your body. Your whole system will feel invigoratedand theres not even barista in the bathroom. SAUNA SAND TI MER (SAND COLOR MAY VARY). Passed down thru the ages we have the timepiece that requires no power. Hand blown glass in a traditional hourglass design, filled with precisely the right amount of sand necessary to measure 15 minutes of elapsed time. Mounting bracket allows the hourglass to revolve 180 degrees so you can easily start a second 15-minute sauna bath and never lose track of time. 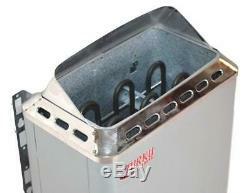 The item "2KW 110V 90 Cu. 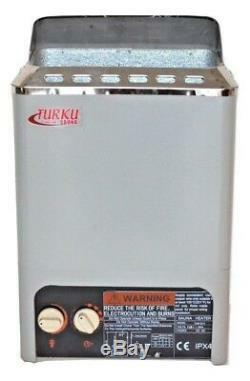 MINI TYPE TURKU SAUNA HEATER STOVE BUILT-IN CONTROL + BONUS" is in sale since Thursday, March 28, 2019. 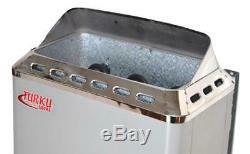 This item is in the category "Home & Garden\Yard, Garden & Outdoor Living\Pools & Spas\Sauna Heaters". 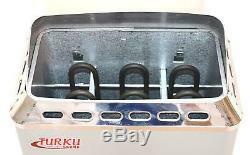 The seller is "a2z_sauna" and is located in Midlothian, Virginia.